Social and fitness activities at senior living communities do wonders for mobility after a fall. Slowly, carefully and with the utmost concentration, Jack Hamm pushed his walker down the center aisle of Westminster Gardens’ residents meeting. It took him awhile, and he could feel everyone’s eyes following him, but he had something important to say. When he reached the front, he turned to face his audience, standing tall and strong with a huge grin on his face. “I don’t need this anymore!” he announced, and flung the metal mobility aid across the room with a dramatic flourish. When he thinks back on that moment, he laughs. “I really put on an act,” he chuckles mischievously. “I was hobbling down that aisle!” It’s a big change from the days before he arrived at Westminster Gardens, a senior living community in Duarte, California. After 42 years as a master machinist, Jack spent the first 15 years of his retirement perfecting his golf swing. He and his wife Dottie still lived in the Pasadena, California, bungalow where they raised their six children. But over time, osteoarthritis, osteoporosis and years of working on his feet eventually made golfing, and even standing or walking, increasingly difficult. He had one knee replaced and six operations to replace cartilage in his hands before Dottie fell and broke her ankle in 2007. Given the steps in their home, their daughter suggested that he and Dottie look for a new place to live. Jack wasn’t too keen on the idea until they drove through the front gate at Westminster Gardens. All the residences were single-story, and Dottie fell in love with the garden homes. They moved in shortly after their visit in 2008. As part of their orientation, all new residents visit the community’s clinic for a full assessment of any physical challenges they have that may benefit from additional support. Staff can then immediately connect them with helpful activities or therapies. Letting his social nature take the lead, Jack quickly immersed himself in Westminster Gardens’ many activities and outings, from workouts and swimming to entertainment or just making the rounds at dinner to chat with his fellow residents. He’s gone on to run resident meetings and plan events like the community’s annual Oktoberfest celebration. Spending time in the fitness center is only one way community life can lead to increased mobility and improved strength. All the socializing that happens in a community can enhance them as well. 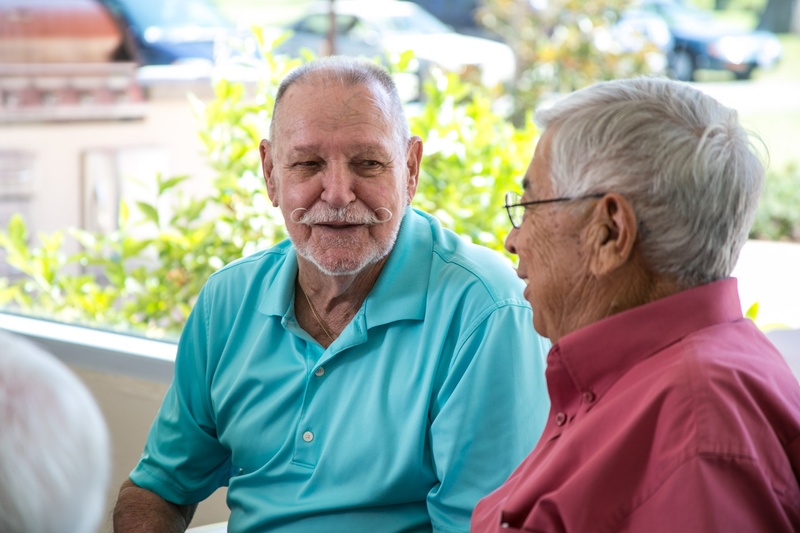 Residents walk to dinner together as well as share activities, outings and wellness programs because they want to make the most of their surroundings. Strength and mobility are byproducts. Jack, who had his second knee replaced about six months after he moved to Westminster Gardens, uses a three-wheeled walker on day trips when he knows he’ll be standing or walking. He hopes to put the three-wheeler permanently aside. “That’s my goal,” he says. With the right support, seniors can regain strength and get back to living an active lifestyle.